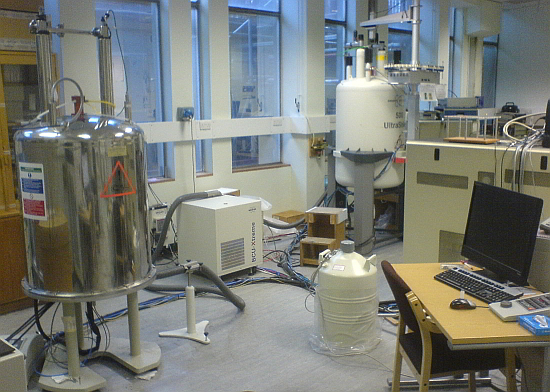 Avance III 400 equipped with BCU-X for variable temperature measurements (-60 C - +130 C); H/C/P/N QNP probe; console replaced in 2008, Oxford magnet is of ca. 1988; there is also a non-gradient multinuclear probe; 24-position sample changer, operated under automation. Two channels, 14-162 MHz and 180-400 MHz. Most of the time (>90%), a four nucleus 1H/13C/31P/15N probe with z-gradients is used (no auto-switch from one nucleus to another). There is also a multinuclear probe (1998, broadband probe TBO 187Os-31P/31P/1H, no gradients, no auto tuning/matching).